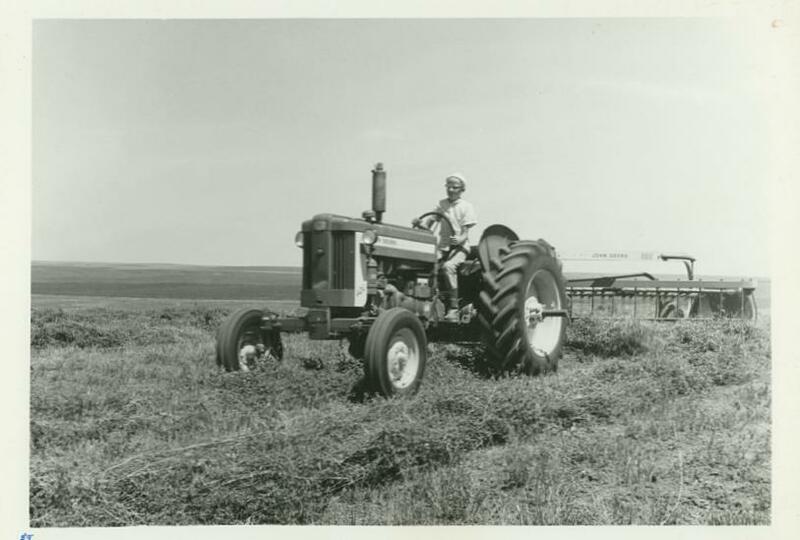 Born on September 12, 1954, Daniel Iversen, and his four siblings were initially raised on a large ranch in Murdo, South Dakota, by their parents, Dale and Deloris. 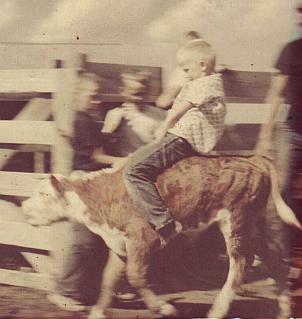 That same ranch was originally homesteaded in 1904 by a Danish immigrant, who just happened to be Dan's grandfather. His Dad liked competing in Baja racing, and local hobby stock car races where he won several National titles. His Mom loved to sew, and longtime IGRA members may remember hearing that she found the time to support her gay son by sewing the rodeo official's vests for the first several years of Arizona gay rodeos. The values of hard work, competition, volunteerism, tolerance, and acceptance, would stick with Dan in the years to follow. During his 4 years at Murdo High School, Dan was the student manager of all the school's sports teams, and won the "School Spirit" award his senior year. He graduated from Black Hills State College - now a University - with a degree in Travel Industry Management, and in his spare time was a member of the National Phi Sigma Epsilon Fraternity Phi Delta Chapter. He served as President of the fraternity in his junior and senior years. After moving to Mesa, Arizona at the end of 1980, Dan put his travel and hospitality degree to work for the next couple of decades, mostly in various positions for the Holiday Inn Corporation. He also merged his previous Midwestern country lifestyle, with a newly 'out' group of gay friends, while discovering gay rodeo. He traveled to a couple CGRA Rodeos, and discovered the large gay crowds at one of the original Reno National Gay Rodeo annual events. Dan traveled to the Reno event with a new gay black friend, a first for him, by the name of Morrie Carter. He was introduced to yet another new gay experience that weekend when Morrie turned himself into longtime Phoenix favorite drag queen Miss Ebony during that first night of Rodeo. Miss Ebony would go on to win the title of Miss Reno National Gay Rodeo that weekend. Dan will tell the story of how overwhelmed he was with the entire weekend of new experiences. Somehow we think he managed to pretty quickly embrace the newness and carry on. Tolerance, acceptance, and that team spirit again. Of all the awards Dan would go on to win over the years, he has probably had the most fun with a series of IGRA Convention declarations. They're always in fun, and always titled along the lines of "Most Spirited Hospitality" Award Winner. Competition, volunteerism, team spirit, Dan's a giver. Dan started his gay rodeo years both in the arena, and in the meeting rooms, as well as being involved in outside related groups. A Founding Member of AGRA in 1984, he was also the AZ Fundraising and PR Director in 1986-87, and would be the Vice President by 1988. He was IGRA Rodeo Rules Committee Vice-Chairperson and Chairperson starting in 1987 and continuing on for a number of years through 1994. In the arena Dan has won over 30 Buckles in Team Events, including five IGRA Goat Dressing Buckles. 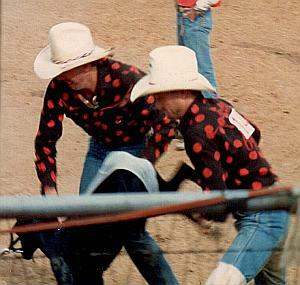 He won his first IGRA Championship Buckle in 1988 with his longtime friend and roommate, Greg Olson. Dan and Greg also were the first to come up with the concept of wearing matching team shirts, polka dots for them. 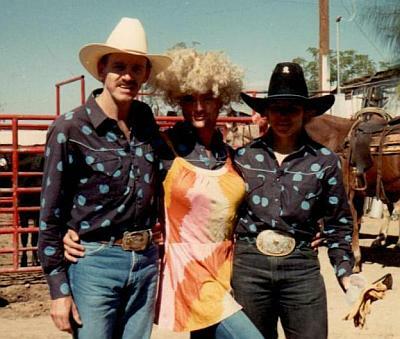 Along with added team member Donna Bell, they won the very first Wild Drag Race Buckle ever presented, at the Dallas Rodeo in 1986 (which was actually the start of the IGRA 1987 rodeo year). 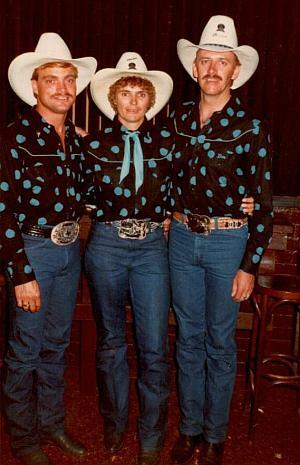 That was also the very first time that Dan and Donna had ever won gay rodeo buckles of any type. That team would go on to win numerous IGRA Champion buckles through the 90's. And again, in his spare time, Dan was a founding member of another group of gay people interested in the Country lifestyle called the Arizona Wrangler's Association. His love of classic collectible cars (he currently owns several of them) caused him to join fellow car enthusiasts in the Central AZ Region of the Lambda Car Club. He also joined gay square dance groups The Midnight Ramblers, Desert Valley Squares, and the Sunburst Squares. In the 1990's and 2000's Dan was still competing a bit in the arenas, but devoted most of his time to the boardrooms. In both Phoenix, and the Tucson Chapter that was active at the time, Dan was repeatedly elected to serve as Vice President, President of Phoenix and President of the State, IGRA Trustee, and as Rodeo Director four times, with a 5th time as a Co-Director, including a Finals Rodeo Director spot. He's been at every IGRA Convention (except the first two) as either a Delegate or Alternate. For the last decade, Dan, now retired from the Holiday Inn Corp, bought and runs a motel back home in Murdo. The Iversen Inn is a seasonal business, and also a basically one person business, a responsibility that keeps him away from Phoenix more often than he used to be. If he's not checking in guests, or doing laundry, Dan is making repairs or planning on the following year's season. This was also the general time period when Dan lost his father, and became the primary caretaker for his mother, along with the help of two of his sisters. He lost his mother in January of 2018 and a third sister in July of the same year. So while not able to commit to year round Board positions any longer, Dan still finds ways to be involved, and keep giving. A longtime collector, of - really anything interesting to him (he may qualify for packrat status), Dan has also been an enormous presence in the collection of AGRA's historical archives. He has been an ongoing supplier of all things AGRA and gay rodeo in general, as well as a major provider of institutional knowledge and memories. AGRA would not have the extensive archives that they do without Dan's support and contributions. Along with three other longtime AGRA members and friends, Dan became part of the self titled Gang of Four, which quickly became the more fitting Golden Girls. Working together, they coordinate and run the yearly AGRA booth at every rodeo, and find additional ways to help out as needed. So much help in fact that they were recognized for their efforts by being selected as the AGRA Rodeo Grand Marshals in 2013. Dan also continues to contribute in monetary ways. From advertising and Champion memberships, to package sponsorships, ribbons and buckles, Dan continues to give to gay rodeo. He's the longtime regular sponsor of the annual Greg Olson Memorial Award buckle, and he helps others to be able to contribute by co sponsoring things with other individuals and groups, such as the above mentioned Golden Girls. Dan has been recognized over the years with numerous honors. Road Runner Regional Rodeo (now Arizona Gay Rodeo) Grand Marshal twice and a third time with those Golden Girls. AGRA's Member of the Year twice. On the International level he's received an IGRA President's Award, Director's Award, International Award, and numerous Trustee's Awards. He is surprised, thrilled, and humbled to even be considered for this ultimate honor of being added to the IGRA Hall of Fame. At the time of his induction into this hall of fame, Dan splits his time between Phoenix, and Murdo, South Dakota.